Also: Narragansett Beer launches watermelon shandy, Rhode Island lawmakers call for statewide sepsis protocols and more. Rachel Nunes. Patch. Wed, 24 Apr 2019 16:07:17 -0400. The FBI and US Attorney's Office accuse a 30-year-old Rhode Island man of making threats against a Massachusetts professor. Jenna Fisher. Patch. Wed, 24 Apr 2019 15:27:49 -0400. ABC News. Mon, 22 Apr 2019 13:26:12 -0400. Two passengers were treated for nonlife-threatening injuries, police said. Arianna Macneill. Boston Globe. Mon, 22 Apr 2019 17:15:43 +0000. Washington Times. Sat, 20 Apr 2019 13:49:30 -0400. ABC News. Thu, 18 Apr 2019 12:41:57 -0400. CBS News. Wed, 17 Apr 2019 02:22:54 +0000. Sandra E. Garcia. New York Times. Sun, 14 Apr 2019 04:27:31 GMT. CBS News. Fri, 12 Apr 2019 12:55:40 +0000. According to the 2010 census, the population of Rhode Island was 1,052,567. In 2008, the estimated population of Rhode Island was 1,050,788, whereas in 2006, the population of Rhode Island was about 1,058,991. For detailed, up-to-date information about Rhode Island's demographics, visit the U.S. Census Bureau's QuickFacts about Rhode Island web page. For maps of Rhode Island, visit this Rhode Island Map website. 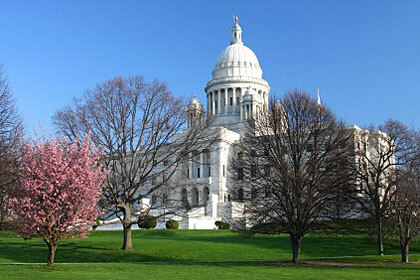 The photograph above shows the state capitol building in Providence, Rhode Island. Rhode Island newspaper publishers are listed here, along with their addresses, phone numbers, and website links; Rhode Island library names, descriptions, and website links are listed on this page. More information about Rhode Island can be found here.